ROTA Pacific awardees enjoy a day’s site seeing in Auckland with Ellerslie Sunrise Rotarian David Broadhead. (L-R): Ravi Changanlal, Sarah Narayan, Sera Raisulu, David Broadhead, Jemima Lanyon and Daniel Fisher. It was smiles all round for five South Pacific visitors recently hosted by the Rotary Club of Ellerslie Sunrise, NZ for the annual ROTA Pacific programme over three weeks that combines both vocational and leadership training. District 9920 Rotary clubs in New Zealand take turns in organising the international visit and join forces with Rotary clubs in the Pacific Islands to invite young adults with leadership potential to apply to come to NZ for a unique experience not otherwise available to them. Jemima Lanyon and Ravi Changanlal from Savusavu, Fiji, Sarah Narayan and Sera Raisulu from Suva, Fiji joined Daniel Fisher from Rarotonga, Cook Islands and first enjoyed a wonderful week of friendship and opportunities with their Rotary hosts. This included visits to the Tip Top ice-cream factory, Hunter Creative graphic design studio, ANZ Bank’s Auckland Head Office and Jenner International Cargo as well as local site seeing as far south as Hobbiton in Matamata and some retail therapy at Sylvia Park shopping centre. Coming from the warmer Pacific climate to NZ’s winter, the ROTA Pacific group gratefully stocked up on thermal clothing before the start of their second week which was spent at the annual Rotary Young-person Leadership Awards (RYLA). 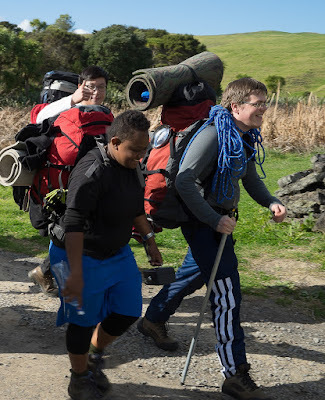 This is a comprehensive week-long, live-in programme sponsored by District 9920 Rotary clubs for up to 120 awardees (aged between 20 and 28 years) based at Willow Park Camp at Eastern Beach, Auckland. RYLA helps young people develop their team work and communication skills and fulfil their potential as leaders. The impressive line-up of leadership, team building, skill development and motivational speakers and activities quickly become life-changing as the participants’ perception of themselves and others changed. RYLA is highly experiential as it includes fitness, survival, problem solving and business promotional exercises, culminating with an outdoor experience that has a surprise component which comes from left field and challenges the awardees far more than most have experienced before. Like ROTA Pacific, each year a different club in District 9920 is responsible for organising the RYLA experience and the Rotary Club of St Johns ran this year’s June 27 to July 4 programme that organising committee chairman Miles Cain said, “required over 7,000 volunteer hours over 18 months to stage, but the effort is more than repaid by the positive changes those involved can see in the awardees over the week”. This is also illustrated by the participants’ feedback. “This is my first time to New Zealand”, said ROTA Pacific awardee Jemima, “And I’m so grateful to Ellerslie Rotary for giving me this opportunity. I’ve made so many new friends and it has opened my eyes to what I can achieve personally and what I can when I return to Savusavu”. Liam Flack, who was sponsored by the Rotary Club of St Johns said, “RYLA has changed my perspective on life and what I value”. Paul Farquhar, who was also sponsored to RYLA by St Johns commented, “We started as strangers but left as mates” … a friendship that continues as the awardees continue to meet up socially and stay in touch via the Facebook page for RYLA 2015. RYLA is run every year with applications being sought from around March. The organising Rotary club in 2016 is Howick Rotary. The website is www.ryla.co.nz (will update closer to the application date).